Think of the blackpoll warbler. and weighing half as much. She flies over open ocean almost the whole way. Oh she is not so different from us. The arc of our lives is a mystery too. that longing that pulls us toward light. hearing the dull roar of the waves below. First published in DreamSeeker Magazine (Summer 2009). Julie Cadwallader-Staub grew up in Minnesota with five sisters, her parents and a dog, beside one of that state’s small lakes. Her favorite words to hear growing up were, “You girls go outside and play.” She now lives in Vermont and still loves to explore the natural world out her back door. 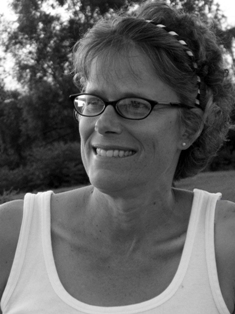 Julie's poems have been published in numerous journals and magazines and are included in anthologies such as The Cancer Poetry Project. Says Julie, "I bought a book about 15 years ago -- A Poem A Day -- that re-kindled my great love of poetry and encouraged me to get serious about it.” Learn more about Jule at www.juliecspoetry.com. I could really relate to this little bird on a treacherous journey. Beautiful! So beautiful and so well-crafted. I loved the connections too. Lovely. This is just a wonderful poem. I've been studying the Monarch butterflies, who migrate too; such a mystery. But people's lives, as you artfully contend, are at least equally mysterious. I love the line that longing that pulls us toward light. which speaks directly to my religious core. Wonderful work! I fell in love with your poems before your book came out, Julie. Love how this one opens with facts about a bird, then goes on to create an even deeper connection.